studio Ardete designed a gymnasium in the city to provide its residents with a place to work out. Studio Ardete got this project from the reference of previously done projects. 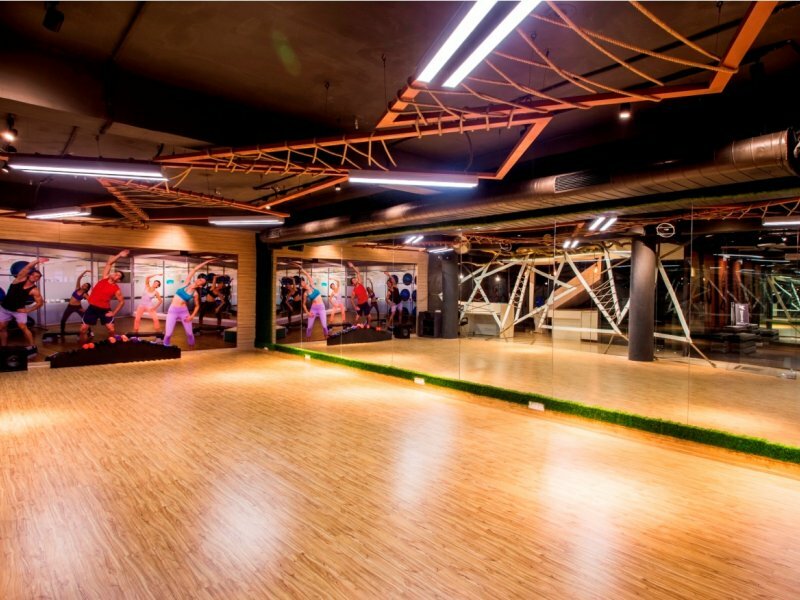 The client for the project has been a part of the fitness industry for the past 5-6 years. Being concerned about the sedentary lifestyle of everyday office goers, he developed the idea of opening a gymnasium in the city to provide its residents with a place to work out. He is himself, what one might call, a 'fitness freak' and love to be involved in high energy exercises. Moksha began as a support facility for his gymnasium as more and more people began using the facility. The project demanded the use of various unconventional ideas to make it more fluid and flexible. As a result, the materials used reflect the same. 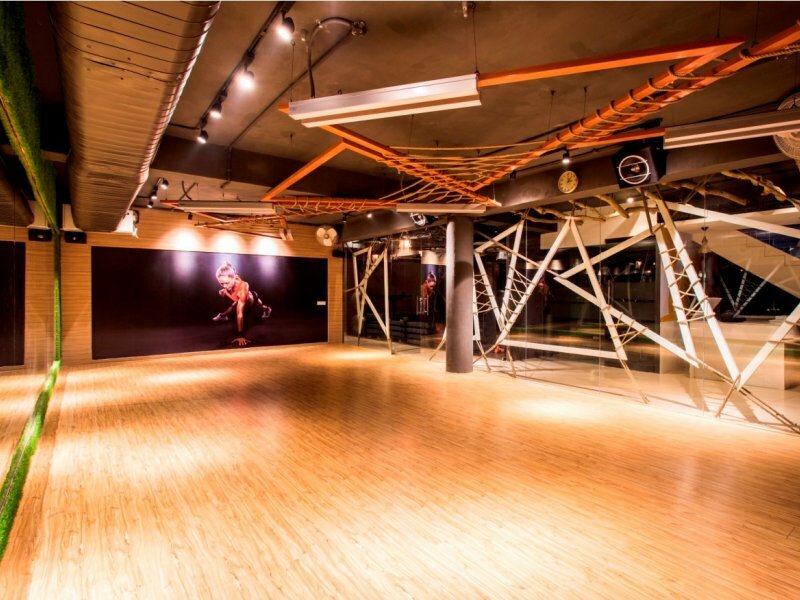 Glass partitions are used for the studios, making the overall design open and contemporary and adding an element of transparency to the space. The viewer is allowed glimpses of the activities going on inside the studios, yet is separated from them. There is a visual connectivity knitting the whole space together. The triangulated frames are made in steel and painted while and rust as per the demands of the location they are being used in. Since, at most of the places they are used next to the glazed surfaces of the studios, they add porosity to the design, thereby, adding another layer to it. Besides, they are used in conjunction with ropes, interlaced between them to provide a degree of stability to the structure, but mostly for aesthetic purposes. Other unusual materials/ elements are the bi-cycles hung from the ceiling and raw wooden branches. The colour palette is subtle, making use of light browns, beiges and black so as to enhance the visual quality of the space and make it chic and sophisticated. The flooring is kept light to contrast with the roof and the ceiling. The studio walls support colourful murals/ posters to break the monotonous theme of the design and make it come alive. Previously done projects gave us a great boost to design this kind of the project. Previously we have done the WAF finalist project by the name of Manasara in which we have given birth vanishing metal cutting indian art. 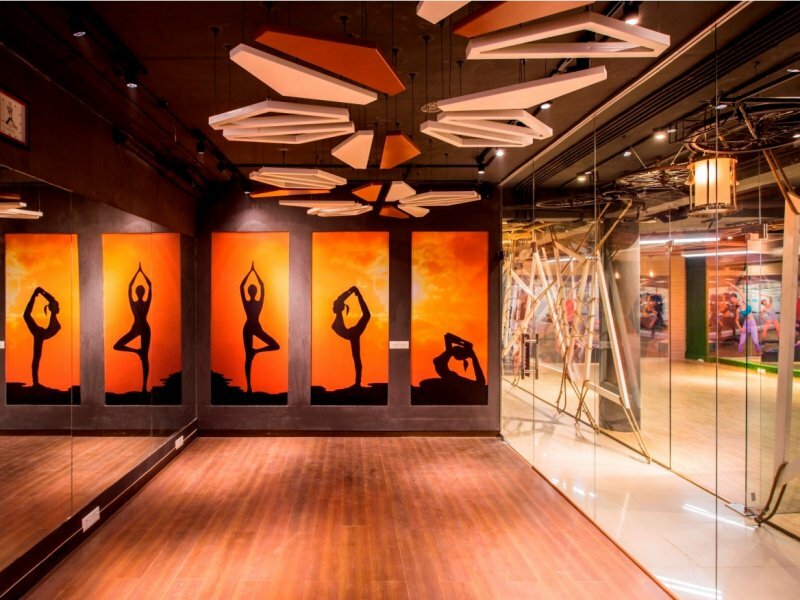 Where most of the fitness centers around the world follow set rules of planning and interiors, Moksha was inspired by a will to define a new language for exercise and training centers. The client desired an extension to the existing gymnasium including a Spa and Spinning studio. This was to be housed in the basement. As a result, the architects were faced with the dual problems of limited space and limited budget. To infuse the design with the energy required for such a competitive space, the plan was kept simple, yet fluid with spaces merging into each other via views through glazed surfaces. A raw, urban look was aimed for and achieved with the help of overlapping and free standing triangular metal frames, crisscrossed with ropes, providing both, an aesthetic element and stability to the design. Subtle colors were used to bring out the whimsical elements of the design to the fore, such as unique lighting fixtures and bi-cycles hanging from the ceiling. 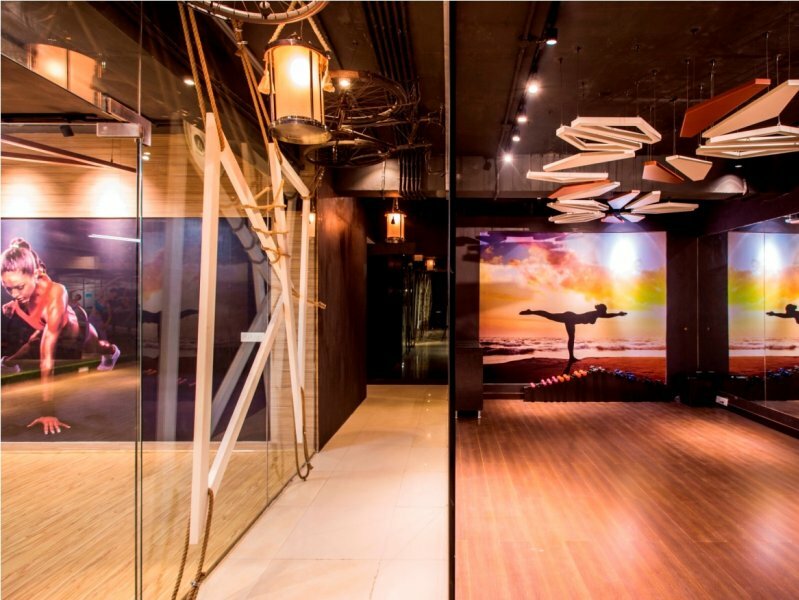 Flooring was kept darker in contrast with the walls and ceiling, balancing the visuals. One of the main challenges of the design was to arrange the entire space program in a limited area in the basement of the existing gymnasium facility. 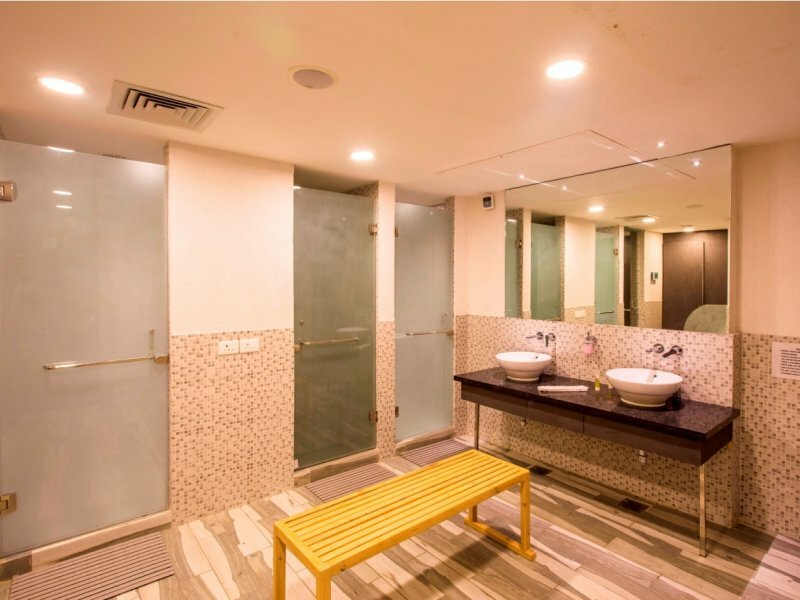 Being a fitness and spa center, the design was required to be open and flexible, allowing for the spaces to merge into one another without undue hassle. To achieve this, glass was extensively used, providing a sense of transparency and connectivity, yet still limiting physical interaction between spaces. Acting as partitions, glass allowed for an ease of visual movement while making the space contemporary and urban. 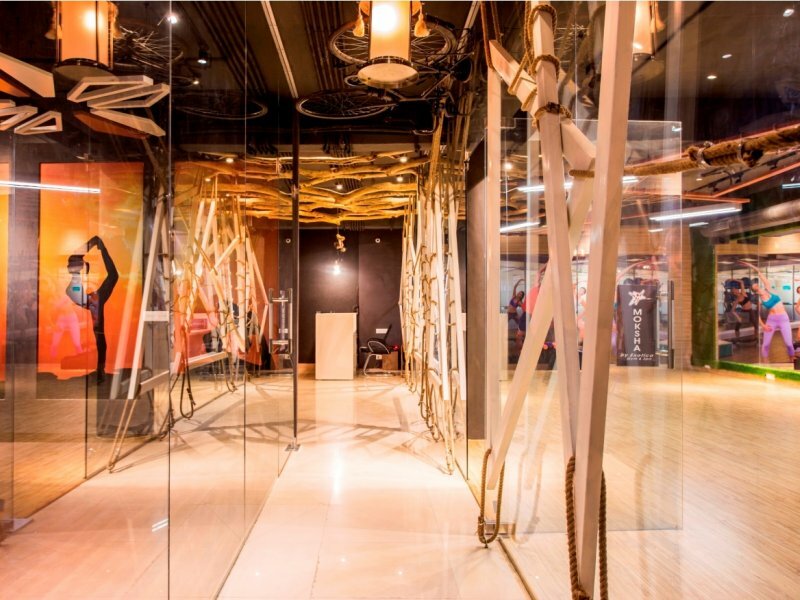 Another challenge was to design the project on a limited budget, forcing the architects to look for unusual, yet eye-catching solution, adding to the user experience and providing a new language for fitness design. Metal Frames A special feature of the design is the triangulated, free standing metal frames that appear at places all over the area. They are not only placed next to the glass partitions of the studios, but also on the ceilings, completing the design in many ways. Adding another layer to the interiors, they are overlapped and interlaced with the help of ropes that not only provide stability, but also adds to the aesthetics of the element. Bi-cycle Dairies and All That Jazz: Sometimes the different between a good and a great design is something as simple as a the provision of a symbol. Symbols, used to define and sum up the whole design, have been used in architecture for time immemorial. It is a way to provide the design with something intangible that, even while being insubstantial in comparison to the overall design itself, makes a strong impact on the psyche of the visitor. Since the architects were looking for a contemporary, yet rugged look, it was decided to make use of old, used bi-cycles and hang them from the ceilings in the passage-way. 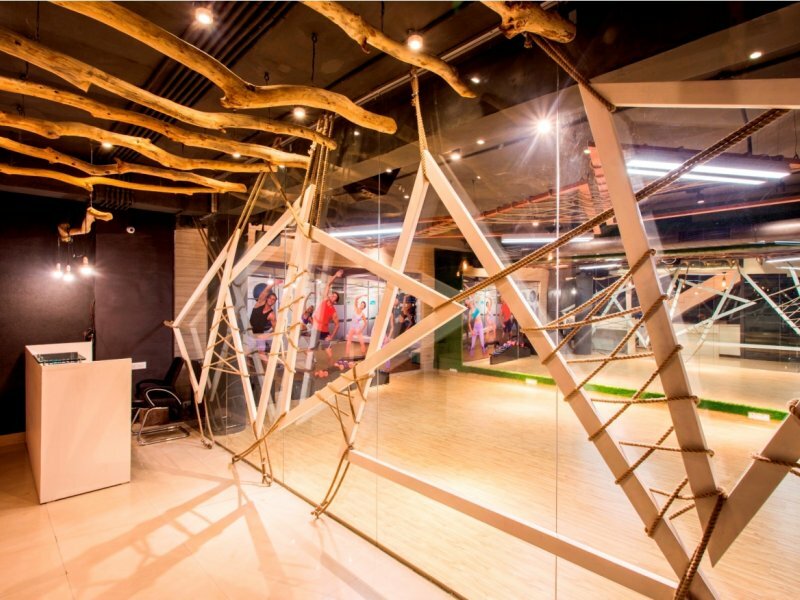 Treated wooden branches were also used for ceiling design to maintain the theme. To break the monotony of subtle, subdued interiors, large colourful murals and posters are used on studio walls. The most distinctive feature of the design is not a single entity but the way it combines all its varied elements together to form a cohesive, aesthetic whole. Of the various features already mentioned, the one that catches the eye are the bi-cycles. Hanging from the roof in the passage way, they draw the eye upwards where one also find unique lighting fixtures giving the space a sharp yet sophisticated look. Another important element repeated all throughout the interiors is the metal frames. 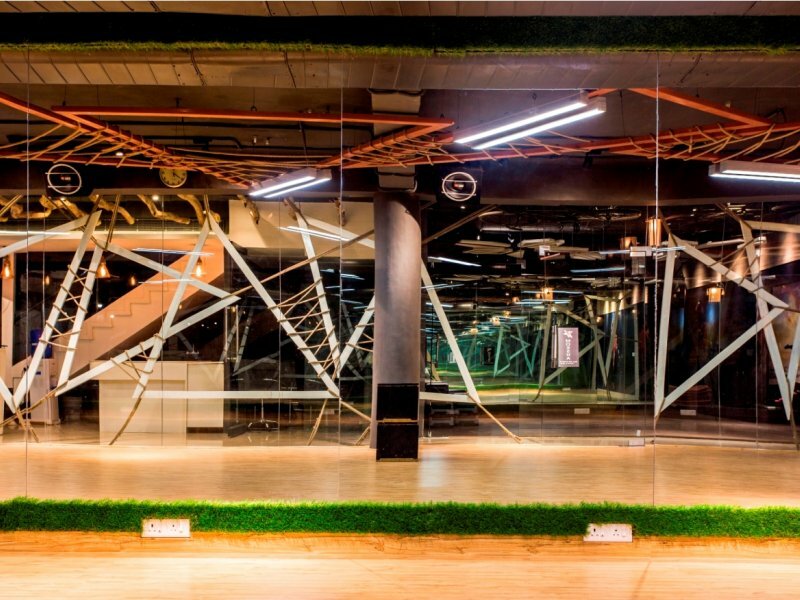 Triangulated and overlapping, these frames distinguish the design and give it a character, unlike most of the other fitness spaces. They are used not only in the interior elevations but also on the ceilings, providing a place to affix the light fixtures. These frames are crisscrossed with ropes, another unusual material. The use of glass is carefully controlled and composed. The glazed studio walls along with the frames provide peaks inside the studios whilst separating the activities of different spaces. The whole idea provides a visual connect to the entire design but does not breach the privacy and identity of the spaces it contains. All the material is purchased from the local market from the recommendation through Studio Ardete.